Atal Bihari Vajpayee was the former Indian Politician who had been elected as a Prime minister thrice, he was also a Bharat Ratan. He was a confident orator and was into active social reformation from his adulthood. He died at 93 on 16th August 2018 at AIIMS. In 1957 he fought the first election where he lost in Mathura but was elected from Balrampur for the Lok Sabha. His oratory skills impressed then PM Jawahar Lal Nehru that he predicted Vajpayee would someday become PM, which Vajpayee proved thrice. 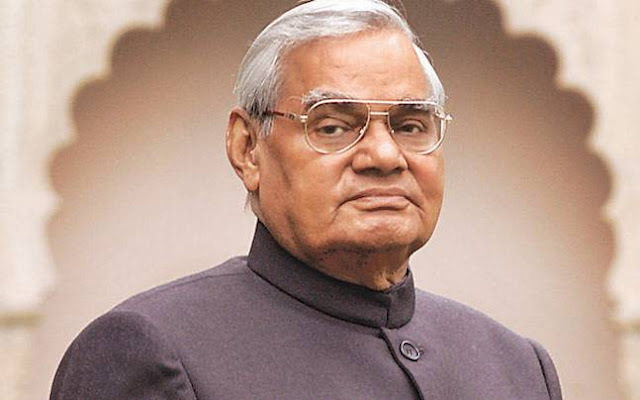 In 1975, Vajpayee was arrested along with several other opposition leaders playing an active role to repeal the Internal Emergency imposed by Prime Minister Indira Gandhi. Became the Foreign Minister after the victory of Janata Dal in 1977 under the leadership of Moraji Desai. As an external minister, he established himself as a great orator and raised his status to The Statesman. He then formed Bhartiya Janta Party with his colleagues form Bharatiya Jana Sangh and Rashtriya Swayamsewak Sangh in 1980's. He became the BJP's first President. The BJP won the First victory in the May 1996 parliamentary elections. In May 1998, India conducted Pokhran-II, the five underground nuclear tests in Pokhran desert in Rajasthan, 24 yrs after India conducted its first nuclear test (Smiling Buddha) in 1974. Vajpayee inaugurated the Delhi-Lahore bus service in February 1999, making Indian a full-fledged Nuclear Nation. During Kargil War Vajpayee sent a "secret letter" to US President Bill Clinton that if Pakistani infiltrators did not withdraw from the Indian territory, “we will get them out, one way or the other” which imposed heavy pressure on Pakistan. The BJP-led NDA won 303 seats out of the 543 seats in the Lok Sabha, in the aftermath of the Kargil operations, getting a stable Majority. Vajpayee became the PM for the third time.